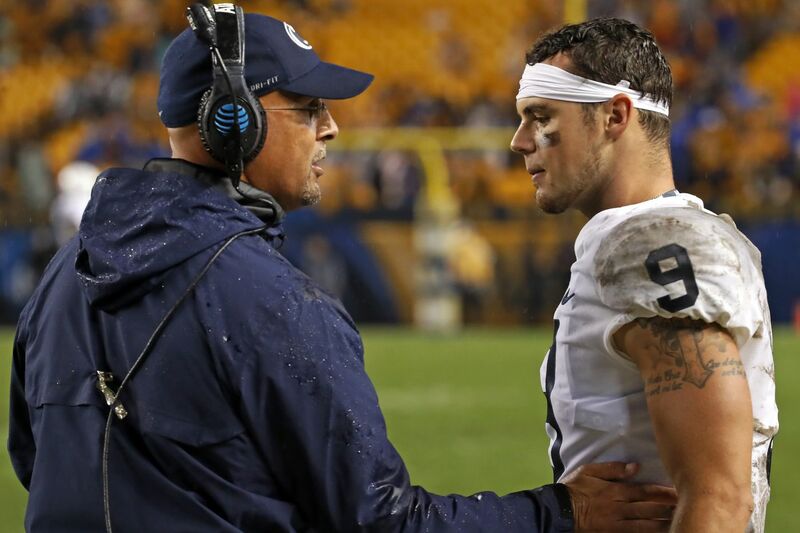 Penn State football coach James Franklin (left) talks with quarterback Trace McSorley during the second half of the Nittany Lions' 51-6 blowout win at Pittsburgh. Give James Franklin this, he has no problem playing the heel. Penn State's coach knew — he had to know — he was making no new friends with his fourth-quarter decision-making last weekend at Pittsburgh. He didn't blink an eye, choosing to play the villain. Pro wrestling fans know how a heel is an important part of the show. College football fans can ask: Was this really necessary? It's one thing to keep your cornerstone quarterback in the game past the point of needing him to win the game. Franklin did that with Trace McSorley. Penn State got the ball with just over 10 minutes left, up 37-6. There was lots of gray area here. Pulling McSorley may have been the risk-averse thing to do. Bring in the next guy, hand the ball off a lot, get to the locker room. "That's always an argument of when you take those guys out,'' Franklin said right after the game. "I think maybe last week played a part in that. We gave up a bunch of points in the fourth quarter last week and I wanted to make sure that we were able to finish the way we should have. Then obviously to get the twos in there and get them some legitimate work was important as well." But yeah, Franklin added, "in these types of games you can always make that argument, what's the right time to get guys out? I get it. But that's always a conversation. I think that last week with how that fourth quarter went, and things I saw on TV earlier today, that's always the fine line." Fair enough, all counts. Even from the perspective of some days away from the game, however, Franklin's moves deserve highlighting. Penn State drove for another score, up 44-6. Pitt fumbled and it was time to bring on backup Sean Clifford. Bring on a first-down pass, 34 yards for a score, 51-6, with 4:21 left. That's a villain move. That said, you want to argue 51-6 looks better than, say, 44-13, you've got an argument. After the game, Penn State moved up two spots in the polls, to 11th, jumping past LSU and Virginia Tech. Both those schools also won easily, but over Southeastern Louisiana and William & Mary. You could argue that 51-6 is the reason for the jump, that, say, 38-13 may not have done the job. Polls shouldn't matter — they don't matter — except the NCAA playoff selection committee also is comprised of human beings who might not watch a particular game, just see the score. They see Penn State 51, Pittsburgh 6. No unseeing that. Where Franklin went full heel was after that touchdown. You saw it if you were watching. A minute left, 51-6, did Penn State kneel down? Penn State did not. Ricky Slade ran, and fumbled. That was not the end of it. Franklin — if he wanted to play the heel, this was the genius move — challenged the call. In a driving rain, game ending. By the tone of his voice, the referee was the least happy person in the stadium to hear the challenge. The challenge itself seemed legit on its merits. But the play stood. Pitt ran two plays and the game was over. At his postgame news conference, Pitt coach Pat Narduzzi was asked if he had a problem with Penn State's last touchdown. "Hey, you know what, I coach Pitt football, I don't coach for anybody else," Narduzzi said. "That's on them. You've got to sleep at night. It's just where we are right now. We'll have another shot. We'll have another shot. It ain't over." Let's note that Narduzzi, who gets his avenging shot next season in State College, has experience at playing the heel himself. Asked the week before the game about a Penn State safety, Lamont Wade, Narduzzi said you don't see the former Pitt recruit out there a whole out there. That kind of shot at a player — full heel. After the game, Wade tweeted, "See me now." When it comes to playing the villain, however, Narduzzi lost the contest Saturday as badly as his team lost the game. Congrats to Penn State's coach. There's no challenging that call.